In this Emergents concert, contemporary music specialists present two side-by-side takes on the future of the classical recital. Performing rarely-heard works alongside new performer-composer collaborations, pianist Jana Luksts and ensemble Happenstance will present recital projects shaped around reimagining how classical music can sound, transforming the chamber music format into something new. Jana Luksts is a pianist fiercely dedicated to the performance of contemporary classical music. Luksts has performed at festivals and workshops in Canada, Greece, Finland, and Germany, and is currently pursuing her Masters Neue Musik at the Staatliche Hochschule für Musik und Darstellende Kunst Stuttgart (Germany). In a new solo set at the Music Gallery, she will present music by Gundega Šmite, Mark Andre, and Elaine Lillios, as well as a newly-commissioned work by ZongYun We. The second half features Toronto-based ensemble/concert series Happenstance. Happenstance features a core band of pianist Nahre Sol and clarinetist Brad Cherwin, who work with guest artists to combine contemporary repertoire with works from the classical canon. At the Music Gallery they will join forces with soprano Alexandra Smither, in a program of chamber music for clarinet, piano and voice—featuring Canadian premieres of works by Pascal Dusapin and Wolfgang Rihm, alongside new collective compositions by Sol and Cherwin based on material from Schubert lieder. The Emergents Series is generously supported by Roger D. Moore. Der griechische Komponist Alexandros Spyrou untersucht in diesem Werk das Konzept der "liquid identity" anhand von kompositorischen, performativen und kontextuellen Mitteln. Alexandros Spyrou hinterfragt das Paradigma der Dialektik und postulierten Identitäten der soliden Moderne und versucht den Entwurf einer Ontogenese von azentrischen Multiplizitäten, welche sich in kontinuierlicher Morphallaxis, einem konstanten Zustand des Werdens, befinden. Mit den Solist/innen Nathanael Gubler (Bratsche), Jana Luksts (Klavier), Bera Romairone (Saxophon), Tatiana Timonina (Flöte) und Stylianos Dimou (Live-Elektronik & audiovisuelle Medien). Eine Veranstaltung des Vereins Delian Academy Civil. Greek composer Alexandros Spyrou investigates the concept of “Liquid Identity” using compositional, performative, and contextual means. Composer Alexandros Spyrou questions the paradigm of dialectics and the postulated identities of solid modernity through the compositions presented in this concert. He attempts to design an ontogenesis of acentric multiplicities that are in a state of continuous morphallaxis; a constant state of becoming. With soloists Nathanael Gubler (viola), Jana Luksts (piano), Bera Romairone (saxophone), Tatiana Timonina (flute), and Stylianos Dimou (live electronics and audiovisual media). Presented in conjunction with the Delian Academy for New Music. Featured alongside Hannah Boone & Jack Etchegary, Dawn Avery, Earheart, and Duane Andrews. "Sound Symposium is an international celebration of sound and a catalyst for new ideas in music and visual and performance art. Sound Symposium is a production of Sound Arts Initiative, Inc., which also produces the new music series Sound Symposium Presents and Night Music, a monthly improvisational music series at The Ship Pub. And, keep your ears tuned to the harbour throughout the year to catch special performances of Harbour Symphonies. Sound Arts Initiative, Inc. produces these on-demand performances for visiting ships and on special occasions." The final concert featuring new works developed during the Experimental Collaboration at the Delian Academy for New Music, led by Jana Luksts. The Experimental Collaboration program focuses on the praxis of collaboration in experimental music and is intended for artists who wish to propose a displacement in the fieldwork practice. Selected visiting composers will collaborate with specialized guest artist (Jana Luksts) on the creation and presentation of a new project which may include theater, improvisation, video or any element from other artistic fields. It is an open space to experiment, rehearse and reflect on one's practice. Participants are also welcome to use the Academy's facilities and equipment. All projects will be presented and recorded in a special performance. Priority for participation will be given to Visiting Composers and Electronic Composers/Sound Artists. Works by Spyrou, Aperghis, Finnissy and Erber. Time TBA. Works for solo piano (and electronics) by the undergraduate composition students of the Aristotle University of Thessaloniki. A final presentation of works developed through a workshop directed by Jana Luksts (piano). Presented in part by the Contemporary Music Lab (Au.Th). Works for solo piano by composers Katehis, Seglias, Maronidis and Spyrou. In partnership with the Contemporary Music Lab at the Aristotle University of Thessaloniki, Delian Academy for New Music and the Fulbright Foundation Greece. 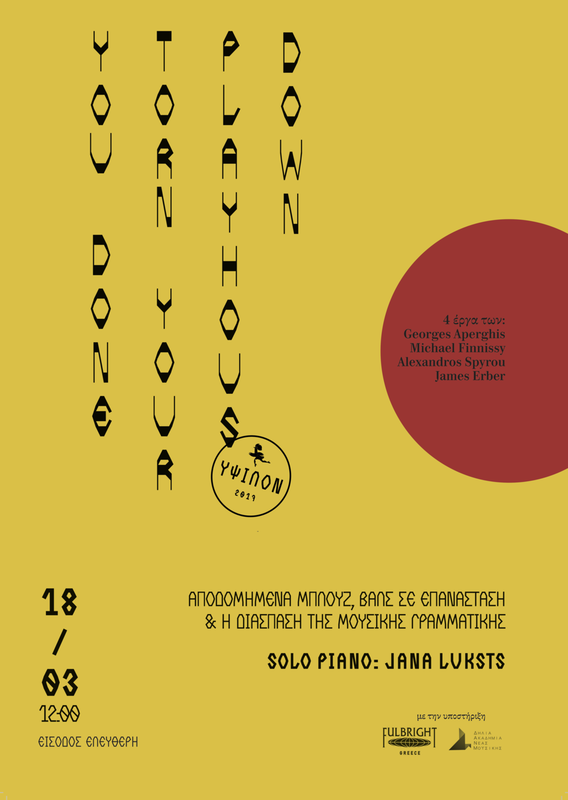 Solo works by Alexandros Spyrou, Georges Aperghis, Michael Finnissy and James Erber. In partnership with the Delian Academy for New Music and curated in part by composer George Katehis, in conjunction with his research as a 2017-18 Fulbright research fellow. Jana Luksts (pianist) presents an immersive discussion on current and prospective performative techniques for piano. With the instrument’s extensive role in the past one hundred years as a vehicle for the design and experimentation of extended (ancillary) techniques as well as the development of “traditional” techniques and playing, the function of the instrument in the context of 21st century composition is brought into question. How can recent and experimental techniques be thoroughly developed and expanded upon to realize meaningful compositions? This presentation is an open invitation to discuss and exchange ideas relating to this issue. Themes to be covered are current innovative compositions for piano, the (careful) integration of multimedia elements, and the questionable role of the instrument within the classical concert format and as a stationary fixture in the recital hall. Composers are called upon to write compositions for piano over the next few months addressing the content of this discussion, to be performed by Jana in May/June. Works for solo piano by composers Michael Finnissy, James Erber and Georges Aperghis.